Accelerate2030 is a program co-initiated by Impact Hub Geneva and the UNDP, with a mission to scale internationally the impact of entrepreneurs working towards achieving positive social and environmental change contributing to the UN’s Sustainable Development Goals. The programme targeted growth-stage social entreprises with tested solutions and business models. Accelerate2030 was successfully prototyped in 2016, where 10 countries participated. 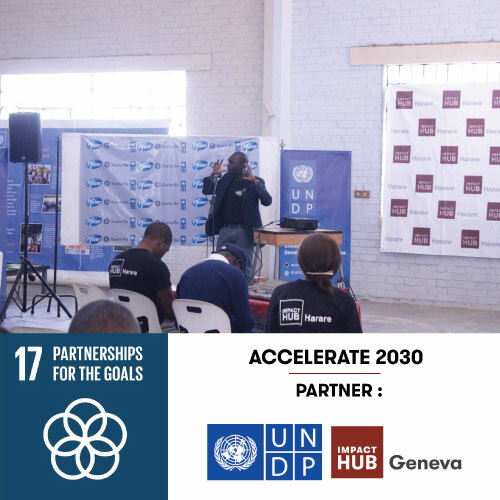 Zimbabwe took part in the second call and the Accelerat e2030 local event took place in June 2017. The top 10 selected ventures pitched in front of a local jury. In 2017, the finalist organisations for Zimbabwe were : Maker Club, Agrk and Victory Farms.